After fleeing from Calcutta, India, to the United States to escape an arranged marriage at the age of 17, Chanda Zaveri, now 49, returns to her hometown as a self-made millionaire. Chanda Zaveri, founder of Actiogen Corporation. She was so determined to avoid becoming like “most Marwari girls of my age” that she preferred to trust an American tourist couple from Boston two years in advance rather than her own family who was supporting the marriage. She had become friends with David and Karen, when she helped Karen reach a doctor, after she fell unconscious on a Calcutta street from a heat stroke. When she found out her parents planned to marry her, Zaveri contacted the couple, who had returned to Boston, requesting their assistance and mentioned that, as a recent graduate, she wanted to pursue a master’s degree. The couple offered Zaveri a sponsor letter. She had no money, only a pair of earrings, which she sold so she could afford an airplane ticket to Boston, where David and Karen were waiting for her. In order to support herself, she worked as a maid for elderly homeowners, one of whom generously offered her an impressive gift of $30,000 to attend Harvard, where she completed the needed two undergrad units to pursue a master’s degree. Soon afterwards, Zaveri was introduced to David’s father-in-law, who adopted her and took her to California, where she joined the California Institute of Technology, conducting research in biochemistry with Linus Pauling, who won the Nobel Prize for Chemistry in 1954 and the Nobel Peace Prize in 1962. Initially, as he did not have any work available, Pauling allowed her to clean the petri dishes. However, quickly noting her keen sense of observation, Pauling started giving her practical lessons on how to create peptides. The first one she made, the B2 Actigen, which improved collagen in the skin, became an instant best-seller. Today, Zaveri owns a Los Angeles based skin care company, Actiogen that produces scientific peptide-based skincare products for anti-ageing, acne, cleansers, toners, day and night creams, sunscreens and stretch-mark removers. Her latest product is expected to generate a $100 million turnover. 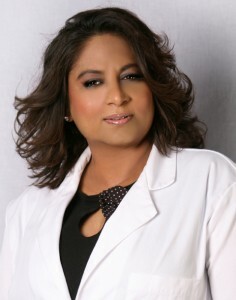 Zaveri was awarded an honorary doctorate from Harvard University for her breakthroughs in skin pigment formation. She is also a humanitarian and uses some of her business to pursue curing cancer, healing wounds and sequencing the proteins in the human body. Her studies try to diagnose genetic disorders and diseases without invasive, uncomfortable and expensive tests, scans and radiology.